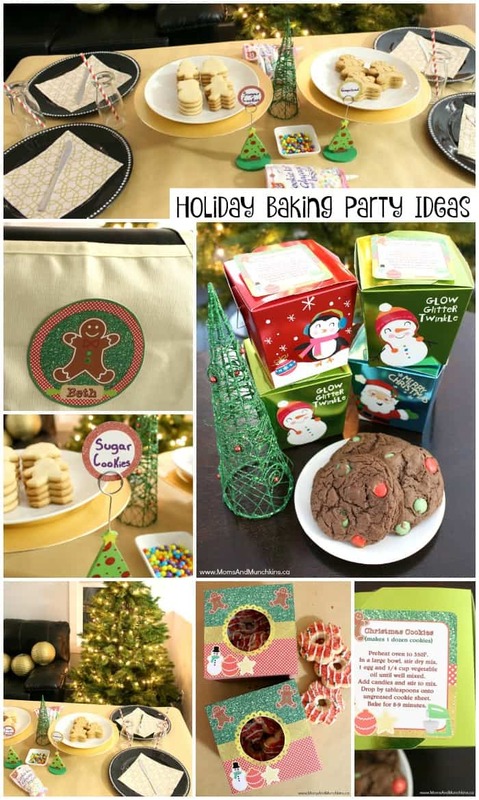 One of my favorite toys growing up was the Easy-Bake Oven so it’s no surprise that one of my favorite holiday party themes is a Holiday Baking Party! All that tasty Christmas baking, decorating & of course all the taste-testing makes this a popular party theme for all ages! 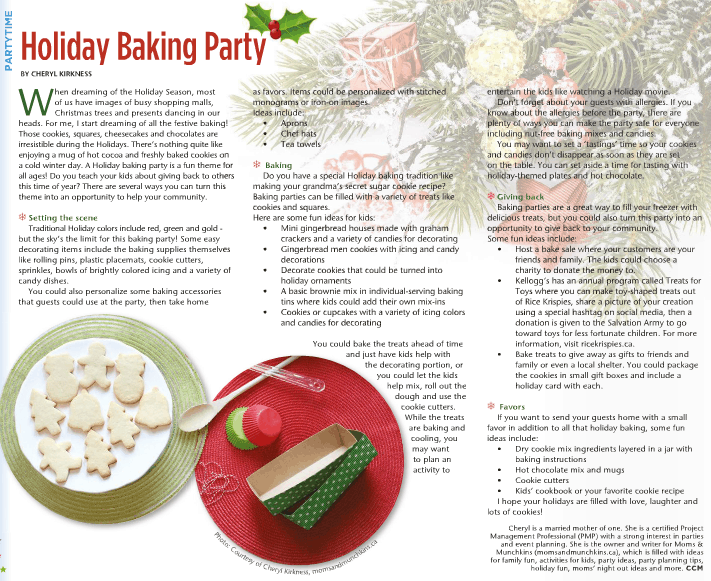 I wrote an article for Calgary’s Child Magazine filled with tips for planning a Holiday Baking Party with decorating tips, what kind of treats to make, party favor ideas & more. I recommend reading that for party planning inspiration. 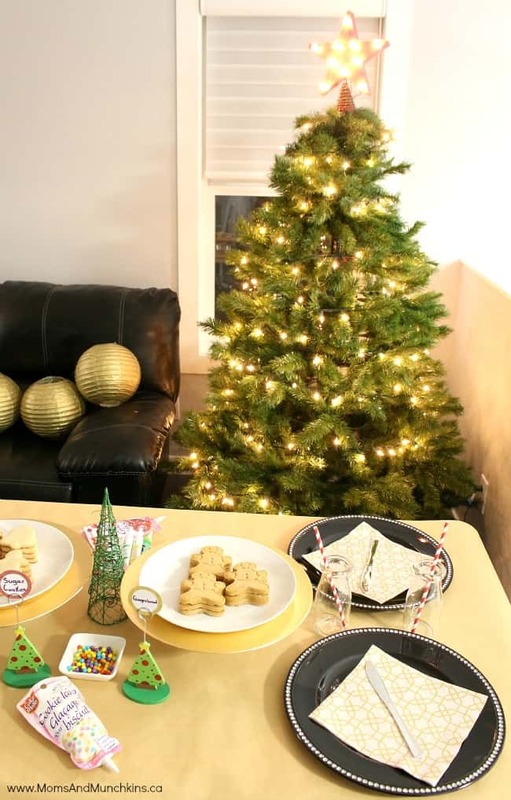 In this article, I’m going to share some additional ideas plus printables to help you complete your party! To start with, you’ll need a cute invitation to welcome guests to your party. 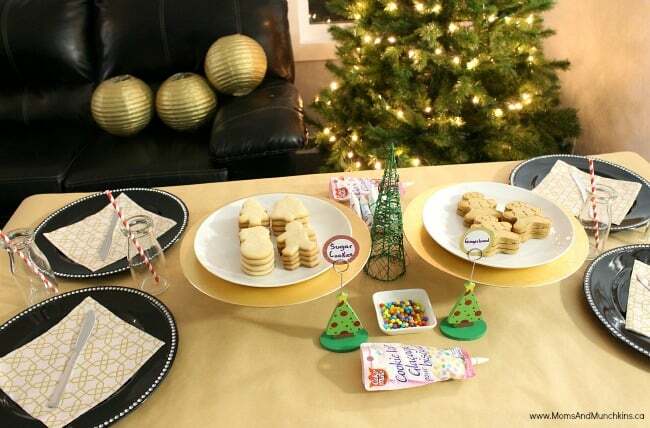 Yes, our Holiday Baking Party printables set includes that! 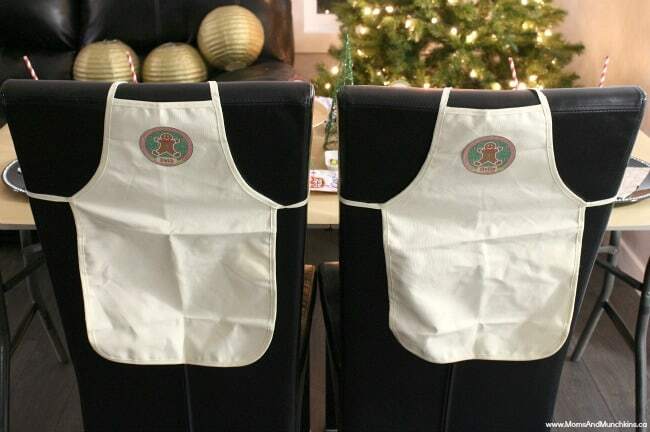 A cute way to personalize your party is to set out some personalized items like aprons with iron-on labels. In this party, I set these on the chairs for when guests arrived. They could wear them at the party & then take them home as a party favor. 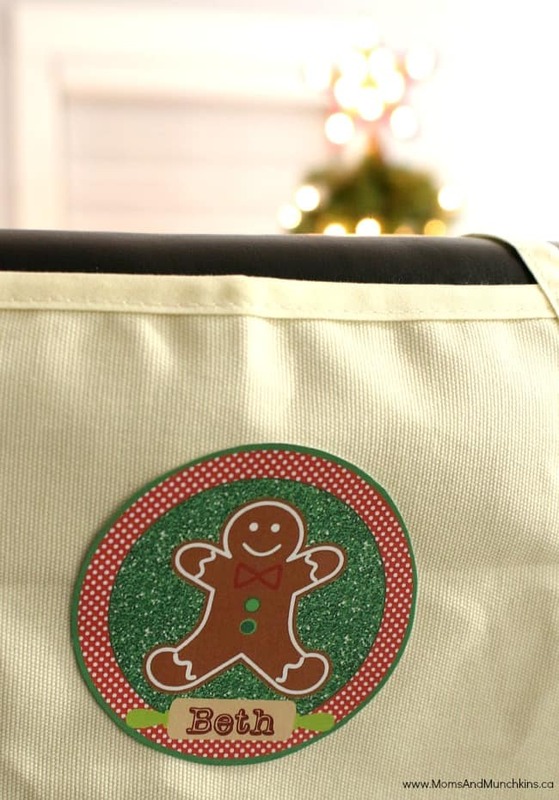 Our Holiday Baking Party printable set includes labels that could be used with iron-on transfer paper. 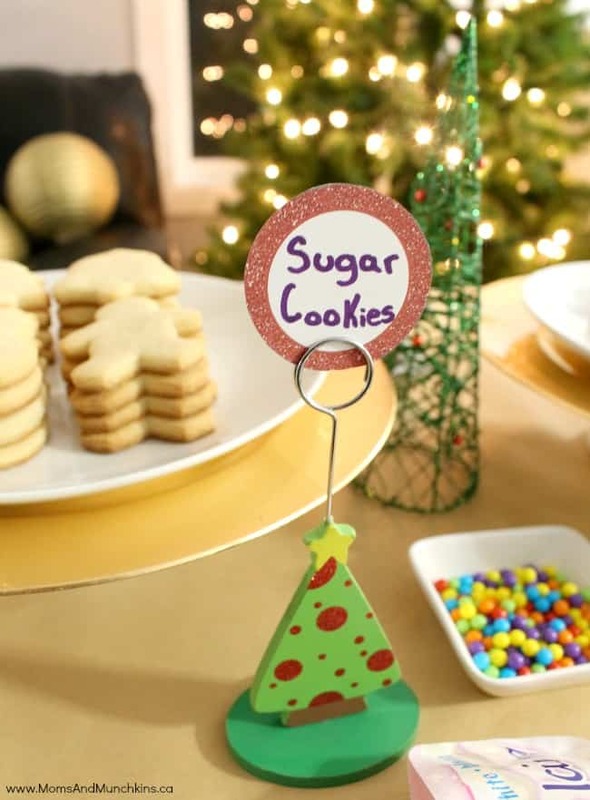 Our printable set also includes blank labels that you can use to label the cookies, candies, icing flavors & more. You’ll want a variety of icings & candies for decorating all those sweet treats. You can start with this royal icing recipe or just buy some already prepared in the baking aisle at your local grocery store. Your guests can start by helping you bake delicious treats like cupcakes, cutout cookies, brownies & more. 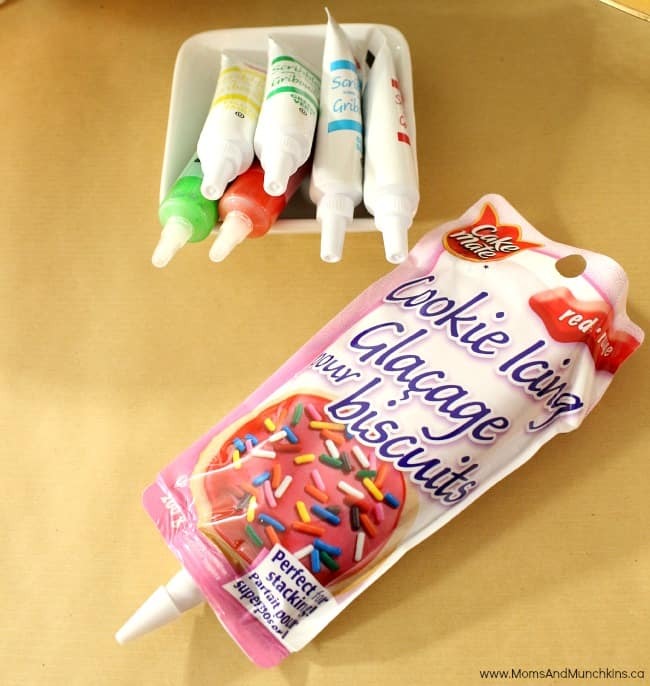 While their creations bake & cool, you could have some previously baked treats ready for them to decorate. One of my favorites is this rolled sugar cookie dough recipe. 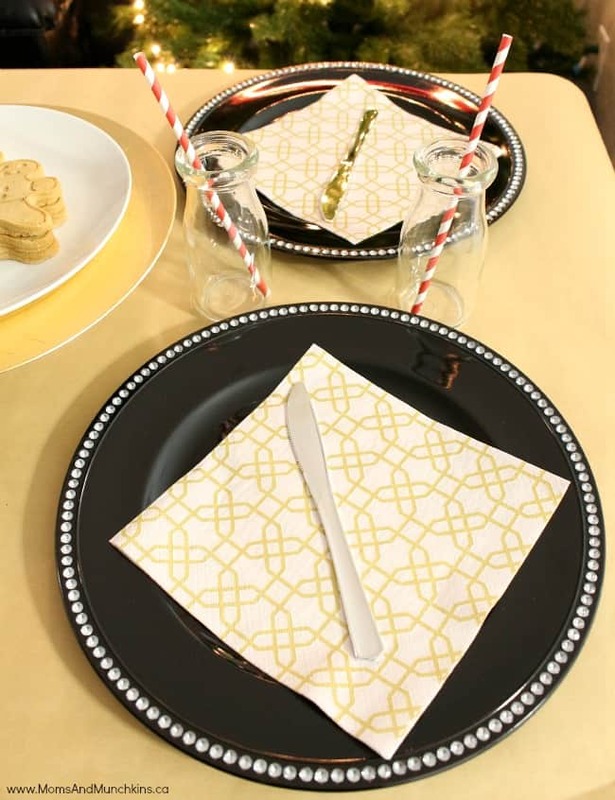 Don’t forget plenty of napkins as it’s sure to get a bit messy with all that baking & icing! 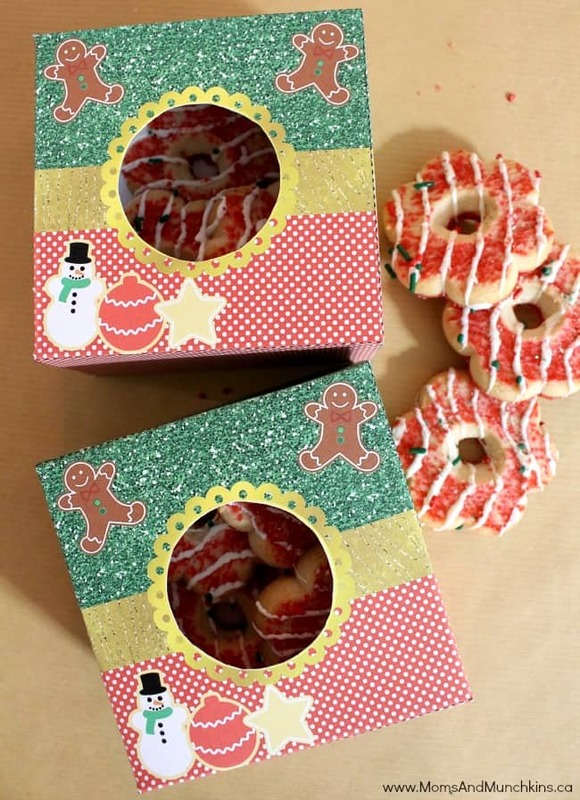 Your guests will want to take home some of their homemade treats so our Holiday Baking Party printable set includes this cute Christmas bakery box. 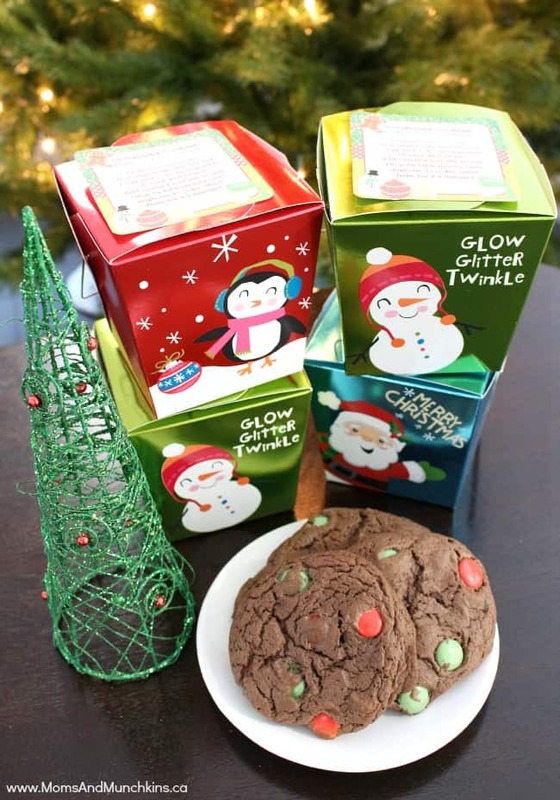 A tasty party favor idea is to send guests home with a dry mix they can use to make cookies at home. 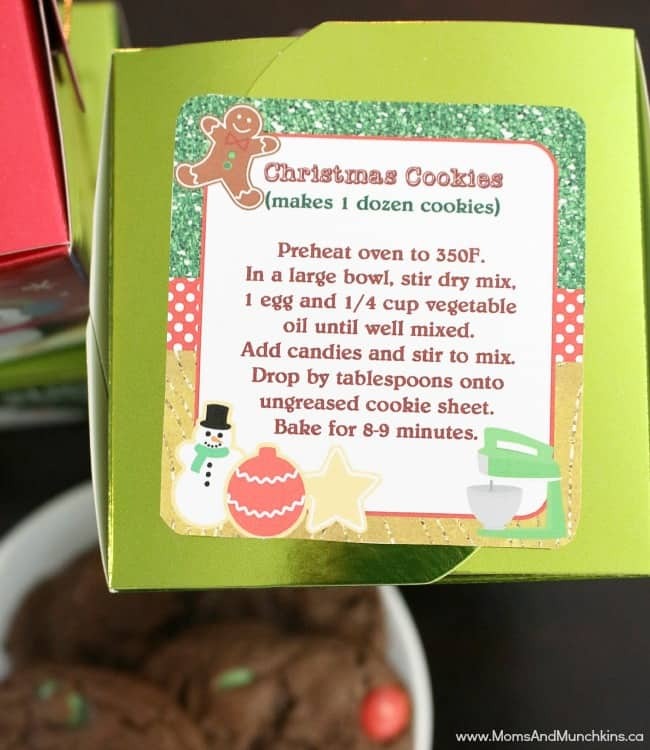 A super simple way to do this is to fill small boxes or jars with half a box of dry cake mix filled with chocolate coated candies like M&M’s. 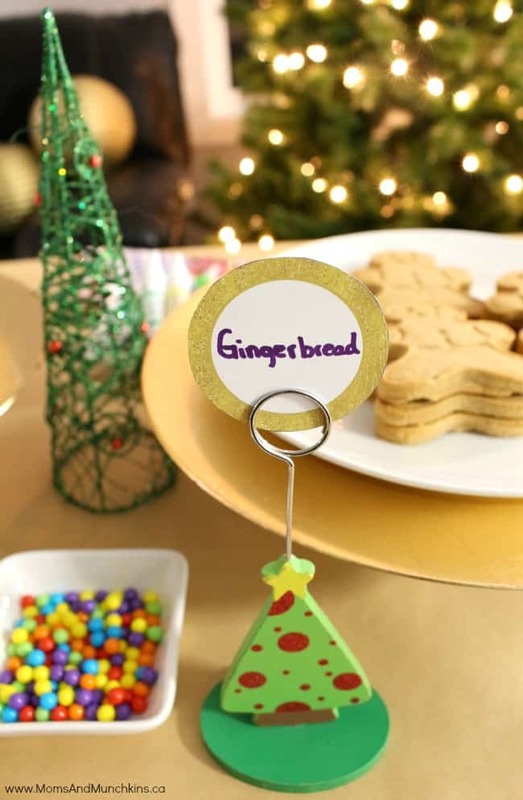 The printable party set includes this cute label with baking instructions. 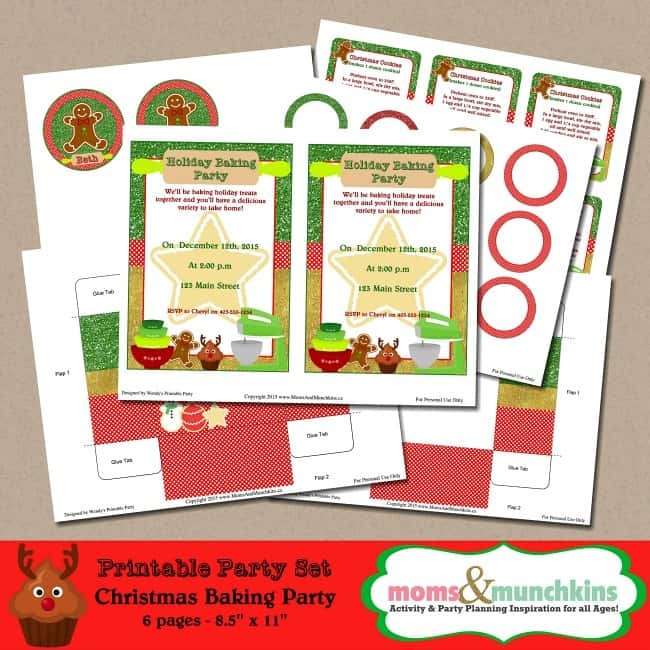 These Holiday Baking Party Printables are now available in the Moms & Munchkins Etsy shop. 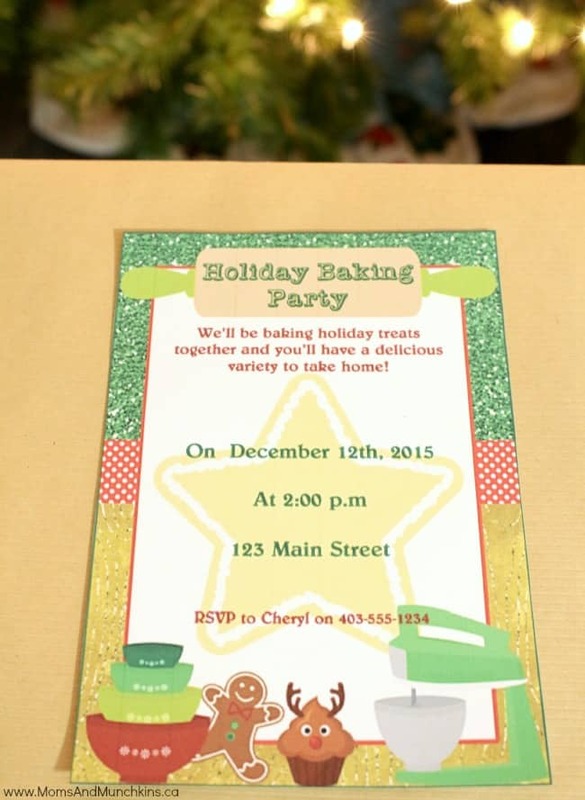 A big THANK YOU to Wendy of Wendy’s Printable Party for designing this set for us. Looking for more fun ideas for the holidays? Check out our Christmas Fun page! 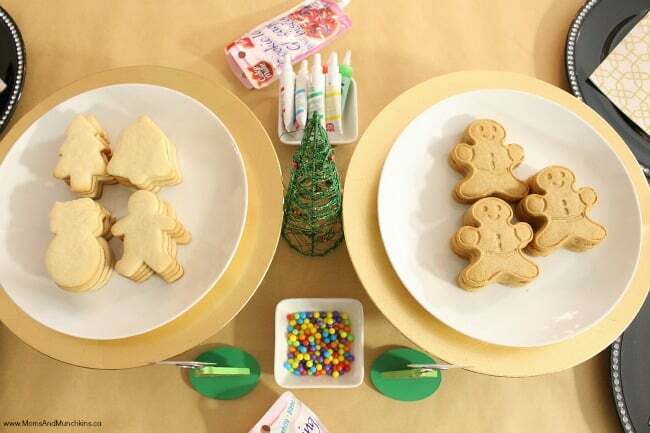 We have free printable games, party ideas, festive recipes & more! What a fun idea! I love your photos, they’re beautiful! !